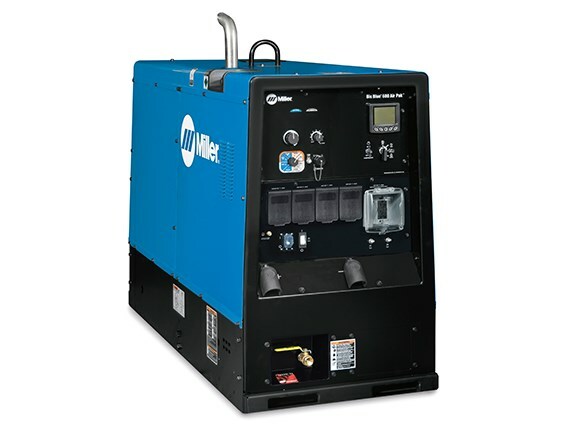 Miller has released the multi-functional Big Blue 600 Air Pak welder/generator, a 600-amp machine that provides field workers with on-the-go power for welding, carbon arc gouging, auxiliary power or running an air compressor. Aimed primarily at single operators performing critical repair and maintenance functions in areas such as rail, mining, construction and fabrication, the 600 Air Pak features a powerful EPA Tier 4 Final-compliant Deutz engine rated at 65.7hp. "Responding to a need in the marketplace, the Big Blue 600 Air Pak from Miller is the most reliable, versatile machine available in its class," Miller product manager Ben Froland says. "We know that jobsite demands vary greatly so Miller has expanded our welder/generator offering to ensure that no matter what your needs are, you can keep your worksite equipment fully functional — and your employees more productive throughout the day." This model features an Ingersoll Rand screw-type air compressor, which Froland says makes it ideal for gouging. It also can operate a full range of pneumatic tools, supplying up to 1,700 lpm of air at 7 bars with a 100 percent duty cycle. Upgrades from previous models include improved arc characteristics, digital weld meters and display, and a 4-inch engine display which replaces the traditional cluster of analogue gauges. A major new feature of the Miller Big Blue 600 Air Pak welder and generator is the ability to use auxiliary power while welding. "With up to 20,000 watts of continuous three-phase power, and up to 12,000 watts of continuous single-phase power, the unit is more than capable of running common jobsite tools and equipment, such as lights, grinders and even other plug-in inverter welders," Froland says. Standard features also include a 120-volt block heater and automatic glow plugs for cold-weather starting, tailorable arc control for SMAW and GMAW processes, and 90m-range wireless hand remote compatibility. Looking for new and used welders for sale? Check out our listings here.